Tello Mobile launches a new deal for newcomers to smooth their way to a more pocket-friendly option. After their first successful order, the credit is added instantly to their account. The best Tello plan depends heavily on what customers need. 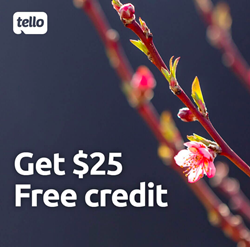 There are Tello Mobile plans to fit a variety of needs, whether that’s a load of data, features, and streaming services or a simple plan with a smidgen of data and an affordable price. Use those $25 to pay your entire phone bill or cell phone purchase. Remember that no partial payments are allowed, yet that is no reason to worry at Tello, given our budget-friendly plan costs. For example, you can have 1GB + unlimited talk & text for just $14/mo or 4GB + 100 minutes + unlimited text for $25/mo. There is no extra fee and all plans include free tethering. Wondering how much data is enough? While 1GB of data might be enough for someone who mostly uses their phone for calling and texting (and the occasional Google search), it may not be enough for most of data hogs. If you stream a lot of video you may be looking at 10GB plans. For a lot of Internet browsing and Instagram use, somewhere in the ballpark of 4GB may be enough. Thankfully, even if you use up all of your high speed data, Tello continues to provide data at a lower speed, so you can still upload your Instagram photos. Besides being flexible when it comes to plans, Tello is also the only wireless carrier rated as ‘Great’, as a result of more than 4,000 reviews from its customers on Trustpilot, a famous review website getting roughly 500,000 genuine testimonials about thousands of businesses each month. Tello is a telecom provider operating on the US market. Tello.com is a KeepCalling brand, a global telecommunications company registered in 2002 in the USA. Presently, KeepCalling provides its services to hundreds of thousands of consumers, with a focus on customer satisfaction. KeepCalling was listed by Inc 5000 as one of the fastest growing companies in the USA for 5 consecutive years.